Historically, discussions on climate policy have largely portrayed cities as the source of problems, painting them as major polluters and areas of intensive resource consumption. The conventional wisdom was—and partially still is—that national governments were the only bodies able to solve global environmental problems. Cities were simply left out of these conversations. In the last five years, however, the discussion has changed. There is now widespread recognition of cities as global problem-solvers, capable of tackling broad issues like climate change. COP 21 in Paris offers the opportunity to strengthen this narrative even further, and show the world that cities are necessarily linked to solving the climate crisis. Urbanization is expected to add 2.5 billion people to cities by 2050, adding to the 3.5 billion who already live in urban areas. Besides serving as home to the majority of people on the planet, cities are also critical to global prosperity. Indeed, 85 percent of the world’s GDP was generated in cities in 2015. To fulfill their dual roles as residences and engines of growth, cities will have to provide services for their growing populations and remain engines of wealth creation, while also ensuring sustainable development. City leaders are increasingly showing they are up to this task, demonstrating across the globe their resolve to develop and implement innovative solutions that not only address climate change, but also make their cities better places to invest, work, live and play. Portland, for example, has met success with its Climate Action Plan, making strides towards its ambitious 2050 goal of an 80 percent reduction in carbon emissions. The city has employed municipal efficiency and renewable energy standards, cultivated connected communities, and invested in light rail and streetcar lines. 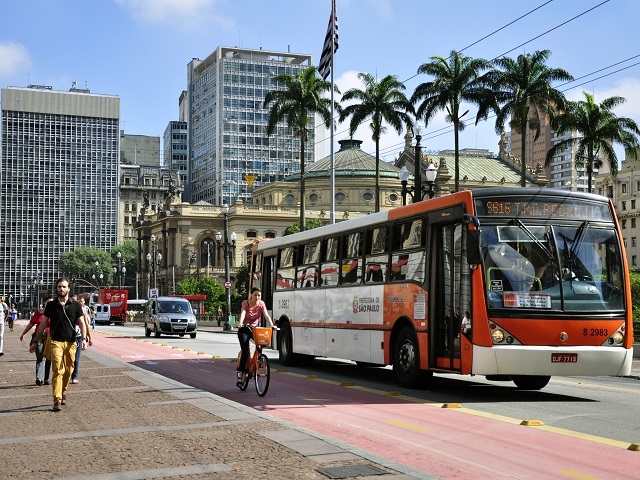 Sao Paulo is another example of a city that has taken the initiative. The city leveraged private partnerships to expand its network of sustainable mobility options, including an integrative metro line aimed at connecting multiple modes of mass transit. Now more than ever, cities have established themselves as factories of climate change solutions, working towards multi-sector solutions that improve livelihoods and city form, while also addressing emissions. The Compact of Mayors further illustrates what cities can bring to the table. In this ground-breaking initiative, member cities have come together on a common platform to pledge commitments to climate actions, independent of national-level commitments prepared for COP21 and more ambitious. Over 300 cities have already joined the Compact of Mayors, comprising huge potential for climate mitigation and adaptation efforts in a collaborative forum. Cities are finally being invited to global climate discussions, recognized as relevant stakeholders, and holding events such as the Climate Summit for Local Leaders. There, former New York City Mayor Michael Bloomberg and Mayor Hidalgo, of Paris, will gather city policymakers for an unprecedented forum during the COP21 proceedings. I hope by the end of the negotiations, cities commit to review their climate action commitments every five years in parallel to the formal UNFCCC process. Taking actions in these areas further legitimizes cities as vital actors in the arena of climate policy. Any meaningful global discussion on climate must lead to local action. This means that we need institutions capable of effecting change that both respects the local context and works toward larger, global goals for the environment. By and large, cities are these institutions. By embracing and supporting cities as centers of advancement on the massive problem of climate change, it is possible to continue successful urban policy experimentation. Cities are the ones taking major risks with new and bold policies, and we have much to learn from their experiences.